The South Dakota Art Museum, located on the campus of South Dakota State University in Brookings, SD, has purchased the work, “Bird of Time” from midwest assemblage artist Erik Ritter for their permanent collection. “Bird of Time” was part of Ritter’s shared exhibition with Mark Stemwedel that closes at the Museum on August 25th. “The title was born from the use of objects within the piece. I used the patches from my original Cub Scout uniform. I happened to be in pack 24, so the numbers and elements seemed to work with the theme of time on a few different levels. Visually, the look of the bird I believe is subconsciously influenced by some Lakota Sioux tribal imagery that I’ve been exposed to for a long time, having grown up in South Dakota,” said artist Erik Ritter. Erik Ritter exhibits his assemblage works throughout the midwest, most recently at Contemporary 33 in Chicago, and the Red Hot Art Festival in Minneapolis. You can view a vast collection of Ritter’s work at www.dejunkedart.com including video’s of his assemblage process, blog’s of current events, and links to other artists. 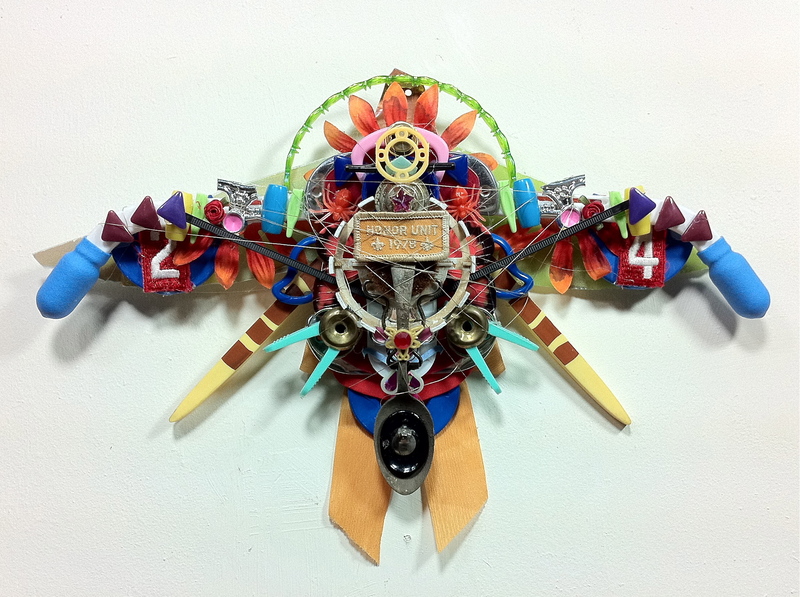 He is teaching a course on found object art at the Banfill Locke Center for the Fine Arts in Fridley in September. Watch the video showing the birth of “Bird of Time” below! This short film was part of the Art Monastery Short Film Festival in Labro, Italy in October of 2011. It was shot and edited by South Dakota State graduate Ryan Wheeler. Wheeler is a senior editor at Periscope, in Minneapolis, MN. Since 1970, the South Dakota Art Museum in Brookings has been a place for people around the world to enjoy the artistic legacy of South Dakota in all its diversity. Rotating exhibits feature Harvey Dunn, Native American art, Marghab linens and Paul Goble; as well as exhibits curated from regional, national and international artists. The Museum has more than 7,000 objects in its collection including paintings, drawings, photographs, sculpture, textiles and ceramics. The Museum Store features jewelry, pottery and original works of art by local and regional artists in addition to books on South Dakota history and culture. The Museum’s hours are 10 a.m. to 5 p.m. Monday-Friday, 10 a.m. to 4 p.m. Saturday and noon to 4 p.m. on Sunday. The Museum is closed Sundays, January-March and all state holidays. For more information, visit www.southdakotaartmuseum.com or call 605-688-5423, toll free 866-805-7590. Next The Replacements teach Syllogisms!